Innovation is beginning to become a bit of a buzzword these days. You hear managers using it: “if only we could be more innovative!” We hear workers talking about innovation. Students, professors, the other day I even heard politicians talking about how they are so innovative! Steve Jobs excerpt from his Apple Inc. TV commercial in1997. Innovation has nothing to do with how much money you spend on research and development. When Apple came up with the Mac, IBM was spending about 100 times more on R&D. So what exactly is innovation? Is it different from creativity? Open your mind and look around you. Probably every object you see has been created and then developed through the process of innovation. No only hi-tech items like your computer, but ordinary items like the chair you are sitting in. The lights. The air conditioner. The pencil. The door lock. Your coffee cup. The building itself. A car. Think about what’s happening in the auto industry right now! As an example, consider the case of the famous 3M product, the sticky note. Dr. Spencer Silver developed a unique, repositionable adhesive, but the scientist didn’t know what to do with the discovery. It wasn’t as sticky as he had hoped, so he put it aside. Six years later, his colleague, Art Fry, remembered the light adhesive when daydreaming about a bookmark that would not fall out of the book. The rest is history. Today Post-it® Brand Notes boasts more than 4,000 unique products, and is one of the most useful products in the world. You may have noticed the words “self-confidence” the model above. Well this a really important concept, because much innovation is held back due to people being unwilling or too shy to say what they really think. So, what are the barriers to innovation? Basically, there are three general barriers to innovation in most companies. The second innovation barrier is red tape, or arbitrary rules and regulations. You will never get innovation if people don’t question the rules. The third barrier is lack of employee self-confidence. As employees consistently encounter barriers to new ideas, they lose confidence in their ability or desire to do anything new. This last barrier relates directly to management style and employee engagement – probably the biggest problem in management today, worldwide. If you have engaged employees they will not be afraid to say what they think and suggest new ways of doing things. So, if eliminating rules is difficult, leaders must focus on increasing stimulus, prototyping and self-confidence. Encouraging prototyping and trying out new ideas is a key to innovation. Stimulus encourages people to view things in new and different ways. So prototyping in the innovation equation is to translate ideas into solutions to a problem. Examples of prototyping include budgeting, mental rehearsal, storyboarding, or staging (a trial). So always remember it is the people in your organization who provide innovation. And benefits can be enormous. Stimulate them. Trust them. Empower them. Engage with them. 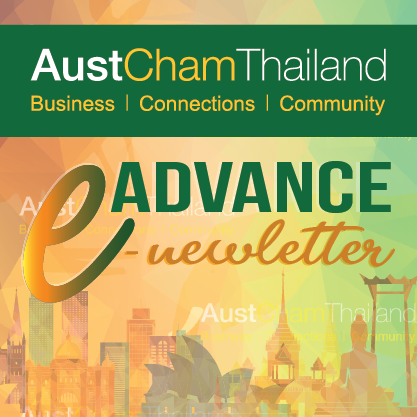 David Bell, Managing Partner, Crestcom – Ra-Kahng Associates Ltd. is a long time Australian resident of Thailand and Member of Austcham. He founded Crestcom-Rakahng Associates Ltd. in Bangkok in 1999. The company provides leadership and management training for a wide range of international and Thai corporations in hands-on subjects as Communication & Engagement; Customer Service & Retention; Developing People; Managing Change; Negotiation Technniques; Problem Solving; Raising Productivity & Time Management; Strategic Thinking; Team Building. David has been Managing Director of Bates Worldwide in Bangkok and Ho Chi Minh City. He was Managing Director of McCann-Erickson in Bangkok and Malaysia and General Manager of McCann-Erickson in Jakarta and Auckland. He is a keen yachtsman and scuba diver.